In BuddhaWheel, you are an endless stream of awareness moving around the Bhavacakra, the Wheel of Life, living life after life in all the realms of existence. Your actions, your karma, determine the conditions of those lives and transform them until you are ready to enter the Spiritual Path that leads to ultimate enlightenment. This non-competitive board game was designed to make delightful play out of the Buddhist teachings of Lamrim (stages of the path), Lojong (mind training) and Lorig (categories of mind). The result is fun and easy accessibility to anyone regardless of age or background. 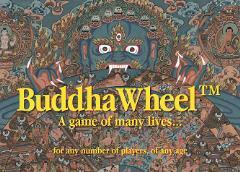 BuddhaWheel helps to develop insight, as well as interpersonal and communication skills. In an age dominated by computer games, younger players are particularly enthusiastic. Players unfamiliar with Buddhism will learn essential aspects of that tradition through the non-competitive play.